Kristy Watson, CMO of Erno Laszlo Skincare, at a recent press event in New York. Since joining Erno Laszlo as CMO three-and-a-half years ago, Kristy has been busy modernizing the brand, revamping its website and pushing for product innovation. 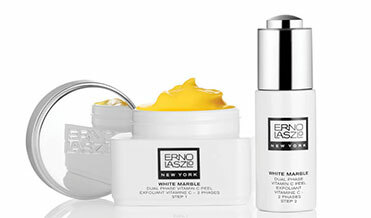 If you’ve ever used Erno Laszlo, you're familiar with its customized cleansing regimens (in high school, I thought of it as the chic version of Clinique’s Three-Step System). The brand still offers luxe, personalized cleansing programs—plus now a bevy of anti-aging treatment products. My personal favorite: The White Marble Dual Phase Vitamin C Peel (it leaves my skin soooooo soft). Curly hair rule #2 Don’t shampoo your hair every day. “I wash twice a week with DevaCurl No Poo, then on the other five days, I just wet my hair, apply One Condition and rinse.” Note from Genevieve: Curly hair is often very dry, so scaling back on cleansing minimizes stripping of scalp/hair natural oils and keeps curls hydrated. The result? More shine, less frizz. The perfect curls (and couple): Kristy and her cute husband. Curly hair rule #3 Put down the brush. “I don’t comb or brush my hair. Ever. I may gently finger-comb my hair in the shower, after I’ve applied conditioner, to lightly detangle…but that’s it. The only brush that ever touches my hair is at the salon, where I go every four months for a trim. The stylist brushes out my hair to ensure my cut is even.” Note from Genevieve: In addition to being dry, curly hair is also typically fragile. Minimizing combing/brushing prevents breakage. Cutting back on brushing also means you aren’t s-t-r-e-t-c-h-i-n-g out your curls, so they can maintain their springy shape.